My art work, meanderings and rants! 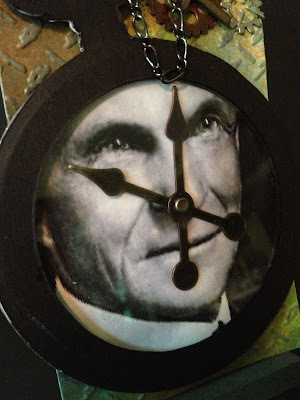 Did you know, Ford's father gifted him a pocket watch, which he took apart. This inspired his tinkering and a desire to build. Did you know Ford made an ELECTRIC CAR along with Edison way back in the late 1800's/early 1900's? Do you care why I know this? Our son, along with his partner, did their National History Day project on Henry Ford, and how his manufacturing strategy helped grow the middle class. They did REALLY REALLY well, and made it to the State competition. Not bad for a couple 6th graders. ANYWAY, about my tag..... 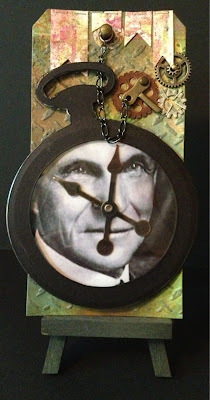 I used Tim Holtz' Pocket Watch and the Circles Dies to cut several layers of black cardstock, the image of Ford, and acetate. I used 4 layers of the die cut pieces between Henry and the acetate layer so that I could put the game spinners inside. The base layer of the tag was embossed with the Diamond Plate & Riveted metal texture fade. It has layers of Distress Ink, Stain, and is spritzed with Perfect Mist to give it a shimmer. 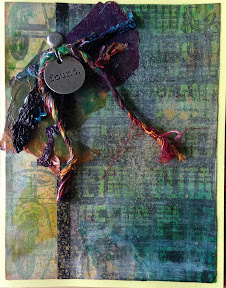 I hand cut the banners at the top from scraps made on canvas paper with my Gelli Printing Plate. 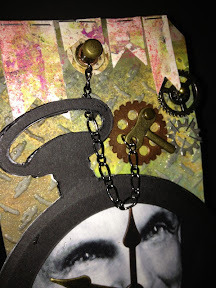 I added a Hitch Fastener to the tag hole, gears and a clock key as accents. 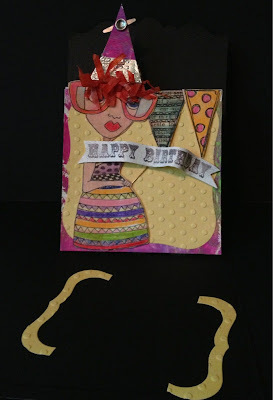 I need to make some birthday cards. I had colored & cut out some stamped images from the Pondering Petunia set by Dylusions a while ago and wanted to use them. They are bright and colorful, fun and sometimes for me, it's nice to go bright. Then banners are also by Dylusions from the Bags of Buntings set. 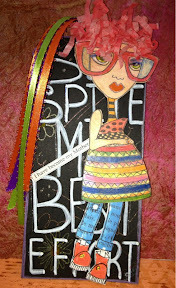 The HB sentiment is from Hero Arts and stamped on canvas paper. I cut it into a banner. The yellow layer is cut from the Labels One set by Spellbinders and embossed with a Cuttlebug embossing folder. 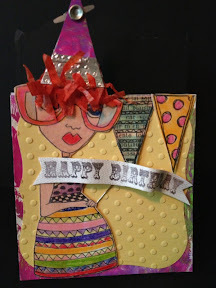 The layer behind that is a print I pulled from my Gelli Printing Plate as well as the scrap which I fashioned into a party hat. There's some leftover embossed Ranger Foil tape added to the hat as well. 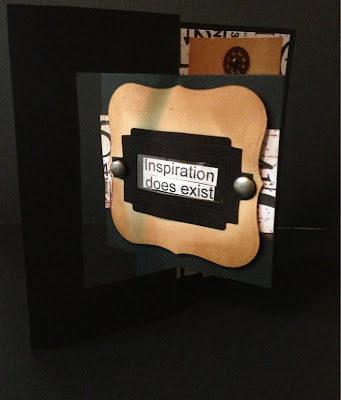 The base card is made using a Card, Ornate#3 die by Sizzix. 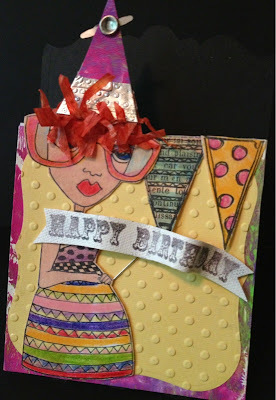 I then used the 3D Pop-up card die using LABEL Pop 'n Cuts insert. This is another one of those dies that I LOVE the idea, LOVE the samples I see, but need to work with because they are so different from my style. When I become more in tune with these dies, I will be able to do 'my thing' more comfortably with them. It's just how I role! One thing I find, being a lover of collage, is that it is VERY difficult for me to 'keep it simple'! 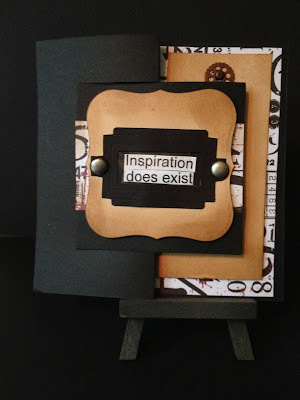 I love the idea of some of the new card design dies from Sizzix. The FLIP-IT's are just fabulous! I got the Square Flip-its as soon as it came out. I have cut this die I don't know HOW many times, and seem to have some 'issues' finishing a card. I cut the card from black cardstock. 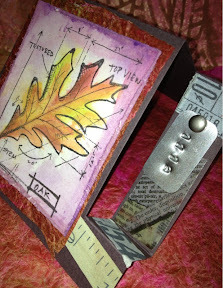 Label One Nestabilities dies by Spellbinder to cut the inside framing, and inked it with Gathered Twigs Distress Ink. These dies also work great with the 3D Accordion Die by the way. 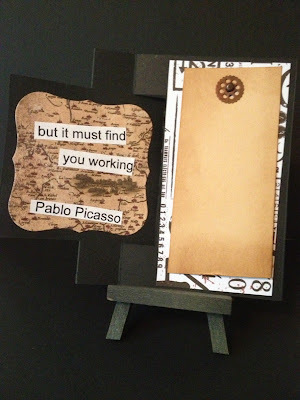 I printed a quote from Picasso, and put the beginning behind a bookplate cut from the Bookplate & Tag die by Sizzix. (if you are keeping count, that's 3 dies I've used on this 'simple' card). 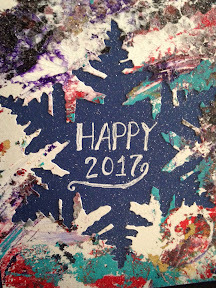 The 2 pieces on the last panel are cut & layered to added a handwritten message. 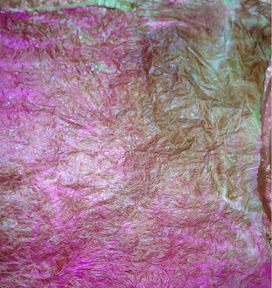 The printed paper I used are from a 7Gypsies paper stack. 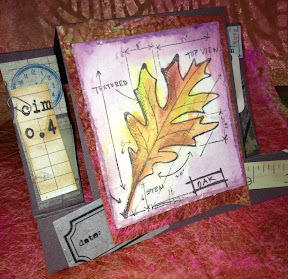 I saw this design for a Center Panel Step Card posted via the Splitcoast Stampers site. It was done as a 5x7, so the center panel was quite large, This is done as an A2 size, but still offers a lot of room for embellishing! 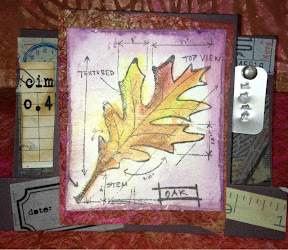 I used watercolors & perfect pearls on watercolor paper to work with the oak leaf blueprint stamp by Tim Holtz. 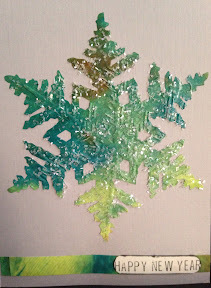 I made this layering piece from Glassine paper. I used Distress Paint in Antique Linen for the base, misted it with water and dryed it. 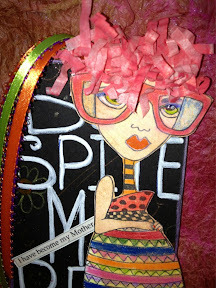 Then I placed a stencil on top, spritz with Terra Cotta ink from Tsukineko and Funky Fushia Dylusions sprays. I also went over it with Teal Tattered Angels. I crumpled up the paper after I had dried it, hit it with a little water, recrumpled & dried it. It looks so cool in real life and has a different feel to it! 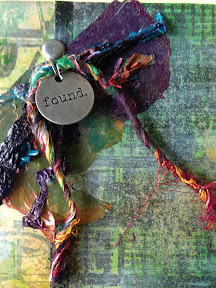 I used various Washi Tapes, a library card cut up and made a metal specimen tag to add to it. 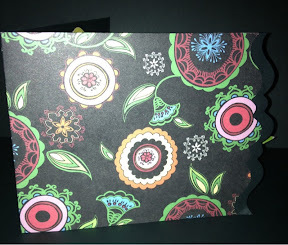 The card offers quite a bit of space to embellish and folds flat for mailing. This card is also known as a Front panel step card. Here are the dimensions so you can give this a try! Start with a piece of cardstock 8.5 x 5.5"
Begin the cuts 1" from the bottom/short edge cutting to the 5.25" mark. MAKE a prototype with copy paper first. Do this once, and it will all make sense! 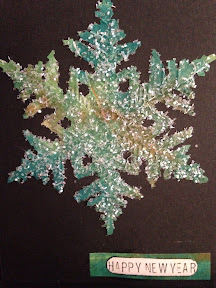 The other day I was playing with some Glassine paper. 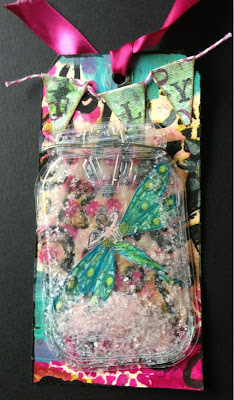 Distress Paint, Tattered Angels Mists, some Distress Ink... Add a little water & a heat gun and the paper curls! I used my Fringe scissors to cut into it to make 'hair'. The stamped and colored (pencils) image is from Dylusions. I wrote the sentiment out with a Sharpie Poster Paint pen to go along with the 'I have become my mother' quote from Lisa's Altered Art. I added some doodling with Gel pens to the background. Simple, yet a fun tag! Oh I had such a cool idea!!!! I had to make a tag with the theme On the Wing.... 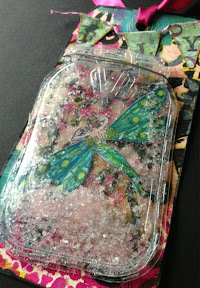 I have this really cool mason jar Sizzix die that has matching embossing folder. 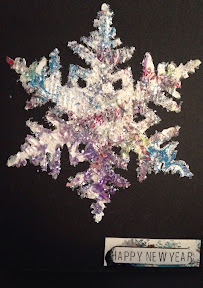 I had previously cut & embossed several in clear packaging. 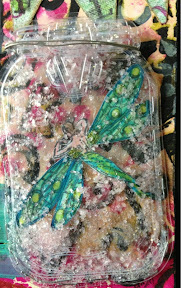 And I had this fabulous dragonfly woman that fits perfectly inside. I had the cool tag from the other day done in similar colors. Best yet , a recipe for fairies in a jar! Pretty sweet hey??? 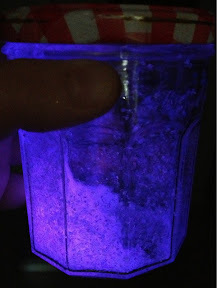 You cut up glow sticks in a jar with Diamond Dust glitter & shake! 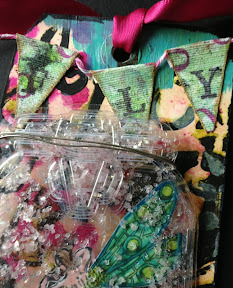 Dylusions Sprays, Acrylic Paints, The Crafters Workshop Stencil, Rubber Stamps, Sticky Back Canvas by Ranger, Gelli Arts Printing Plate, Glitter, plastic packaging, Sizzix Bigs Die & Embossing Folder, Twine.